When and why do governments promote non-state legal orders that seemingly undermine their monopoly on rule-making and enforcement? The presentation will uncover the logic of promoting customary law and Sharia in Ramzan Kadyrov’s postwar Chechnya. First, it will analyze the costs and benefits of promoting non-state legal orders rooted in custom and religion for the ruler. Second, it will explore how the conflict affected these costs and benefits. The analytical leverage to test the argument comes from the cross-temporal comparison of postwar Chechnya (2007-2017) with the de facto independent Chechen Republic of Ichkeria (1991-1999), as well as the cross-regional comparison of Chechnya with neighboring regions of Ingushetia and Dagestan. 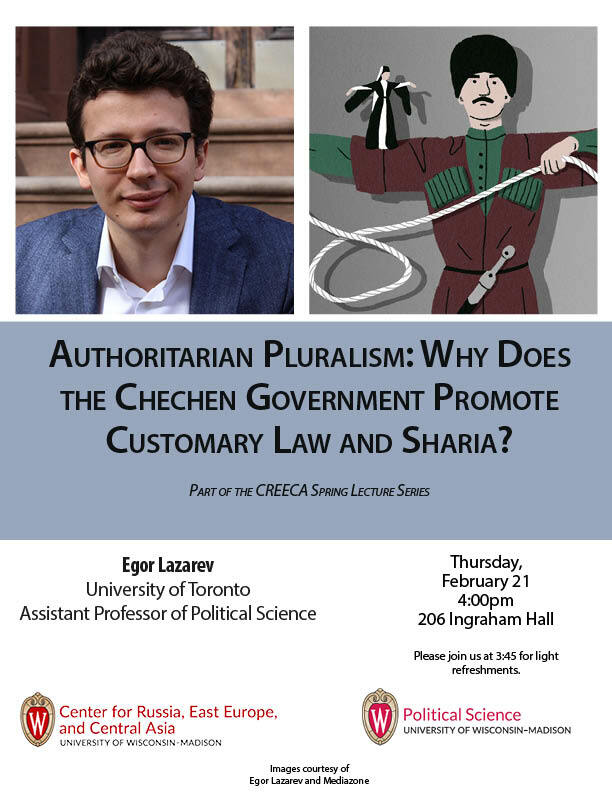 Egor Lazarev is an assistant professor of political science at the University of Toronto. His main research interests are state-building and the rule of law, social and political legacies of conflict, and ethnic and religious politics. His primary geographic focus is the Muslim-majority regions of the former Soviet Union. His book project “Laws in Conflict” explores how the social and political consequences of armed conflict affect legal pluralism – the coexistence of Russian state law, Sharia, and customary law in Chechnya. Egor’s previous research has been published in World Politics, World Development, and Political Science Research & Methods.